The ROV Jason returned to the deck at 1820 hours today after a very successful 24-hour dive to 3650 meters below the sea surface at TAG. The elevator recovered six major samplers earlier in the morning. By the time Jason returned, Amy Gartman and Alyssa Findlay already had their samples analyzed for a variety of measurements such as pH and iron concentration and processed the samples for later analysis back in our laboratories at UD. All scientists were excited as we obtained great high definition underwater video of black smoker chimneys, shrimp, and bacterial mats. They rushed to the Jason basket, which houses all our sensors and boxes for samples, to retrieve all the s amples. Our School of Marine Science and Policy biology undergraduates, Megan Shaffer and Juliana Letterie, helped with the sample processing. 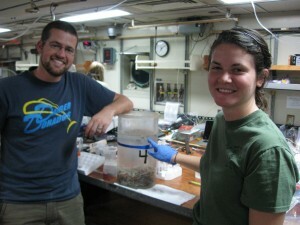 Megan assisted Mike McGinley with shrimp sampling (see photo at right) and preservation for later studies as Juliana assisted Dave Emerson on isolating iron oxidizing bacteria. The shrimp are about 2 inches long. During the dive, we sampled for chimneys that contain easily seen larger pyrite particles, which are gold in color. Bill Geppert received a chimney to display at Cape Henlopen High School and Mike McGinley got a smaller one (see photo below). Congratulations go to Paul Spencer and Tyler Davidson, our Del Tech summer interns, as the in situ filtration unit worked successfully under the great pressures at depth. There were no electrical or mechanical failures. Because of time and weather constraints we did not power up the system for too long, so did not get as many particles as desired. The weather forecast for TAG was not within the Jason launch and recovery sea state, but Snakepit did look fine. Tonight we are heading to Snakepit and will be there around lunch time. After seeing the updated weather forecast, we will make a decision to launch Jason or not. We will likely stay here for 2 dive days and return to TAG after that.